Diffraction intensity contrast maps for Fe0.94O measured at 24.7 GPa. Researchers from the U.S. Department of Energy Office of Science’s Advanced Photon Source (APS) and the High Pressure Synergetic Consortium (HPSynC) show the first imaging of non-reflection domain wall structures forming in the ferroic transition of the ferrous oxide Fe0.94O. The study brings a new understanding of the origin of the cubic-rhomboid transition, underscores the need for a greater understanding of how defects in a material influences electronic and thermoelastic properties at high pressure, and demonstrates the power of the new nanodiffraction imaging technique for investigation of pressure-induced phase transitions. The transition-metal monoxide FeO is an archetypal example of a Mott insulator—a material that should conduct electricity under conventional band theories but becomes an insulator when measured, especially at low temperatures—and a major iron-bearing component of the Earth’s interior. Understanding the high-pressure behavior of this material is important for both solid-state physics and Earth science. But despite considerable study over the past 30 years, the origin of the well-known high-pressure-induced cubic-rhombohedral ferroic transition in FeO, which is a distortion of the original cubic structure to that of as rhomboid shape, has been not well understood. Now the first imaging of non-reflection domain wall structures forming in the ferroic transition of the ferrous oxide Fe0.94O has been reported by researchers from the U.S. Department of Energy Office of Science’s Advanced Photon Source (APS) and the High Pressure Synergetic Consortium (HPSynC). The team carried out the study at the 2-ID-D x-ray beamline at the APS, applying a pressure of approximately 250,000 atm in a pressure vessel called a diamond anvil cell, and imaging the material’s crystalline structure using the new high-pressure nanodiffraction imaging technique developed by these researchers. The team’s results revealed a non-reflection type of domain wall structure forming due to the so-called “cubic-rhombohedral transition,” where the crystal structure of the material changes from cubic to rhomboidal. This discovery suggests the cubic-rhomboid transition could be associated with defects in the material and is unlikely to be caused by ferroelasticity, in which a material may develop a spontaneous strain, as predicated by previous research. The surprising impact of defects on structural stability discovered by this study not only brings with it a new understanding of the origin of the cubic-rhomboid transition, but also underscores the need for a greater understanding of how defects in a material influences electronic and thermoelastic properties at high pressure, which has almost never been taken into consideration in previous high-pressure studies of materials. In addition, this study demonstrates the power of the new nanodiffraction imaging technique for investigation of pressure-induced phase transitions, which has emerged as a very active area in condensed matter physics, but until now has lacked suitable in situ techniques for probing the nanoscopic origins of the transitions. Image: Yang Ding et al. 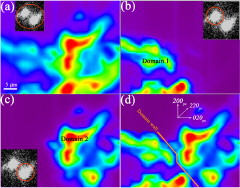 Be the first to comment on "Researchers Show Imaging of Non-Reflection Domain Wall Structures"